A quick note: The Gini Index ranges from 0 to 1. At 0, it means that every household has exactly the same level of income. At 1, it means that all the income is going to just one household and everyone else is getting nothing. The Gini Index does not necessarily speak to levels of income. For example, populations where everyone is either similarly very rich or similarly very poor would both have low Gini indexes. 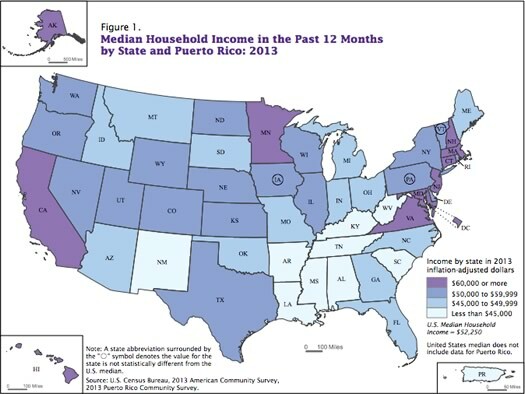 First, how New York State stacks up against other states (and Puerto Rico). The map above is from the Census Bureau. 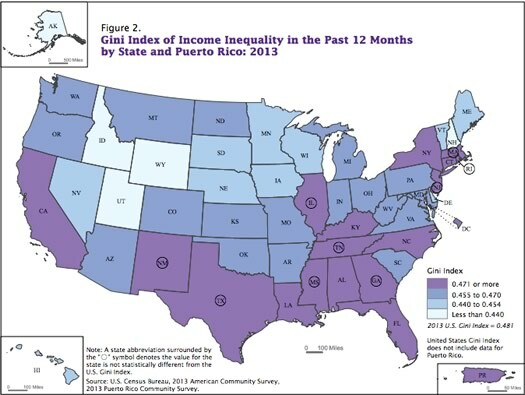 As you can see, New York has one of the highest Gini Indexes in the nation. New York's high ranking is probably in part a result of the contrast between New York City (where some people enormous amounts of money) and upstate (where many people don't). The downstate counties lean toward the upper end of the index. And Manhattan really leans that way -- its index is .6012. So where does the Capital Region stand compared to the rest of the country? Here's another clickable map, this time of metro areas with more a 2013 estimated population greater than 500,000. The metros are shaded according to their Gini Indexes. Compared to these other large metros, the Capital Region's income distribution is very much toward the more equal end of the spectrum. In fact, the Capital Region's Gini Index (.4403 - margin of error .0097) ranks as roughly 10th lowest among large metros. There's a sortable table above in large format -- click or scroll all the way up. In this case, "large metros" means metro areas with more than 500,000 total population.